Canara Bank has published today the recruitment notification/advertisement "Probationary Clerks Recruitment Project 2/2012" for a huge vacancy of 2000 Clerk positions. While the submission of online application form for Canara Bank Clerical Recruitment 2012 starts from 18th June, 2012, the last date of online registration & submission of form is 1st July 2012. This notification has been published in the Employment News of today. You can also click here to find the Canara Bank Clerk Recruitment 2012 notification/advertisement. 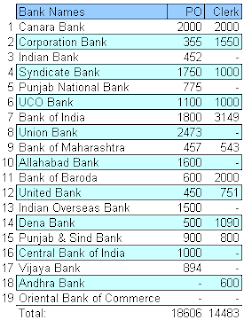 This is the 11th Clerical recruitment projects by the Indian PSU banks.